If you are looking for stylish furniture that's durable, aesthetic, reliable and offers value-for-money, then this is where you'll find it. Steel n Style is a leading steel furniture brand of residential and office furniture, including almirahs, filing cabinets, lockers, tables and book shelves. By maintaining reliability and ensuring the most trustworthy source of steel, Steel n Style has become India's most preferred brand of steel furniture. Our innovative products have won the hearts of customers across the country and our user base is growing every day. 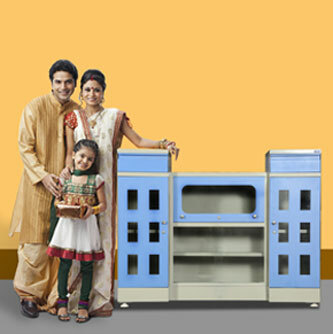 Each product in our range is designed to offer a perfect balance of investment and satisfaction. We are committed to offer stylish and affordable furniture at attractive prices to our loyal customers. We use the finest Cold Rolled Steel "Tata Steelium", manufactured in Tata Steel's state-of-the-art facilities. Impeccable standards of manufacturing and quality control ensure you get high performance steel in every Steel n Style product. Trusted by users across the country, for over 10 years, Tata Steelium ensures a world of unbeatable advantages that guarantee durability, longevity and perfect finish of your Steel n Style product. Advanced welding technologies ensure highest strength of the product. Electrostatically applied and cured under high temperatures for the required time. Gives a perfect finish, desired texture and attractive look. Steel n Style is a name that is synonymous with quality. A dedicated inspection team throughout the processes ensures the best quality for customers. To ensure that your furniture reaches you intact, two layer packaging (bubble wrap and six ply carton) with proper sideguards has been provided. Delivery is within 7 working days from the day of order placement. Delivery charges may vary depending on distance of drop-off location from the store.